Virginia, recruited by British Intelligence to be its “eyes and ears” in Vichy France, needed a cover story to keep the French Secret Police and Gestapo from prying into her clandestine life. Early in 1941 she contacted a family friend on the Board of the New York Post and was offered a position as a foreign correspondent. Being a journalist gave Virginia the freedom to ask probing questions of Vichy officials, determine their loyalty, and recruit a network of informants from among the disaffected. In 1941 and 1942 she published a few articles in The New York Post about life in Vichy France. Using her true name in the byline bolstered her credentials as a “legitimate” newswoman. In actuality, Virginia was posing as a journalist to further her clandestine reporting. George Backer, her “cut-out” at the New York Post, accepted Virginia’s secret reports and passed them to British Intelligence in London. Early in Virginia’s career as a journalist-spy, she sent her secret messages via Western Union telegram, encoding them to throw-off government censors looking for forbidden and espionage communications. 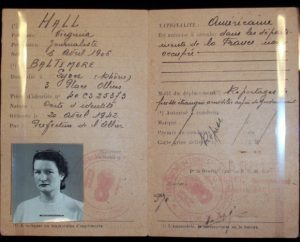 This Carte de Identite’, issued by the Vichy Government, was a critically important document because it gave legitimacy to Virginia’s cover assignment as a journalist. Though she used her true name when working as a newswoman, she employed a wide variety of “pseudos” (pseudonyms–false names like Philomene, Germaine, and Marie) when engaging in clandestine activity with her agents.